Larry Nelson is driving a silver Chevy Silverado 1500 with Texas plate JSX3544. UPDATE: The Silver Alert was discontinued as of 9:45 p.m. Monday. 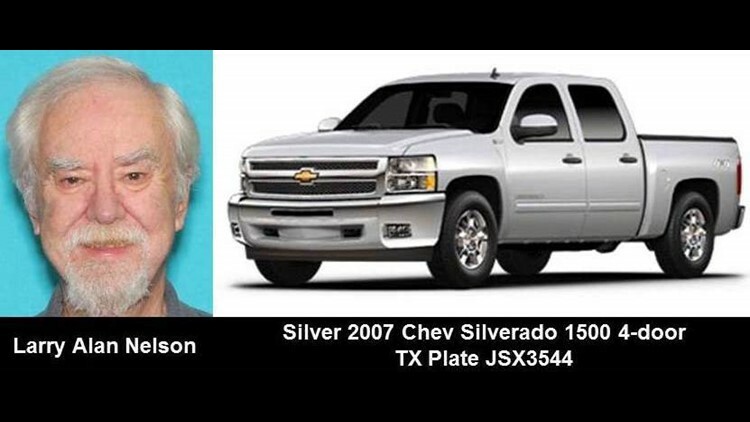 Larry Alan Nelson is driving a silver Chevy Silverado 1500 four-door with Texas plate JSX3544. He went missing from San Antonio on Monday. Nelson is 70 years old and is described as standing 6-foot-2, 180 lbs, gray hair, brown eyes, wearing a navy long-sleeved shirt and blue jeans.